VENICE, FL--(Marketwired - July 14, 2016) - Freedom Boat Club, the nation's oldest and largest boat club with 12,000+ members in 21 states and Canada, recently concluded its first-ever cause-marketing campaign to benefit Big Brothers Big Sisters of America. Total donations raised by Freedom Boat Clubs nationwide totaled $61,594.00. Freedom Boat Club President and CEO John Giglio presented the check to Big Brothers Big Sisters of America President and CEO Pam Iorio at the organization's national headquarters in Tampa on July 12. "We are very excited by the results of our "BOATING BIG! ALL ABOARD FOR THE LITTLES," inaugural cause-marketing campaign and appreciate the generous support of our Freedom Boat Club franchise operators, members and vendors in our efforts to raise funds for Big Brothers Big Sisters of America," said Giglio. "Our corporate team and entire franchise family was very enthusiastic about rallying together to raise funds for this outstanding youth organization. We're especially pleased that the majority of funds raised return to the various communities where they support the effort of local affiliates." Freedom Boat Clubs participated in several fundraising initiatives. Many hosted "All on Deck Parties" for Bigs (mentors) and Littles (mentees) that introduced them to fun boating and fishing activities. "While the fundraising is obviously important, our corporate and franchise team really enjoyed creating a special boating event for the Bigs and the Littles … we hope these experiences will create memories that will last a lifetime," he added. "Our country's youth needs caring adult mentors more now than ever before, and we truly appreciate partners like Freedom Boat Club that support our network, strongly believe in our mission, and connect our Bigs and Littles with the world around them," added Iorio. "The support of partners like Freedom Boat Club helps our affiliates focus on matching more children with supportive mentors." According to Giglio, the Freedom Boat Club North American organization will join together once again in 2017 to partner with Big Brothers and Big Sisters of America. 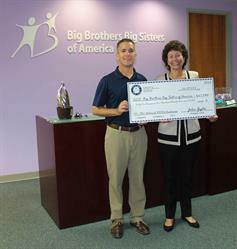 John Giglio, Freedom Boat Club President and CEO, presents check to Big Brothers Big Sisters of America President and CEO Pam Iorio for $61,594.